#AO: [POLL] AOL: WHO'S THE MOST INFLUENTIAL LADY IN POP MUSIC TODAY? [POLL] AOL: WHO'S THE MOST INFLUENTIAL LADY IN POP MUSIC TODAY? Attention, AOL Music readers! To celebrate Women's History Month, we here at the site will be posting our very own "March Madness" type bracket. But instead of pitting basketball team against basketball team, we're having the ladies of pop music battle it out for the top title of "Most Influential Woman in Pop." 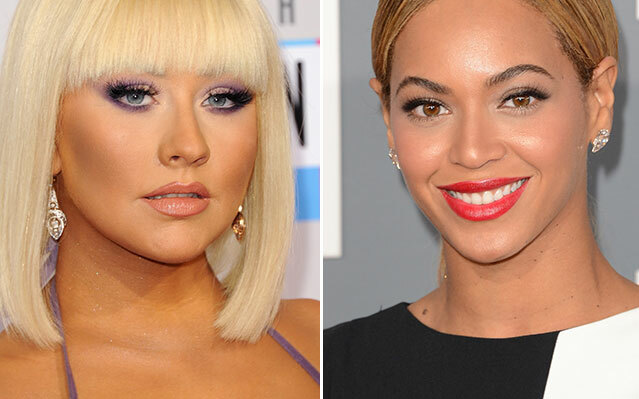 Our second round grudge match features two '90s pop stars: Christina Aguilera and Beyonce. In the past few years, Christina has made a major comeback from her "Genie in a Bottle" days! The singer's recent stint as a judge on "The Voice" shows there's more to her than powerhouse vocals. On the other hand, there's no denying that this is Beyonce's year. Her incredible Super Bowl halftime show and touching HBO documentary prove that there is no stopping Queen B. Who do you think should win round two of our "Most Influential Woman in Pop" March Madness bracket? Vote below ... and check back on Wednesday (March 6) to see the next two divas battling it out in round three. I swear I'm just saying Christina because I'm a huge fan but she really is. What other female pop star can navigate through pop, r&b, rock, jazz, latin pop...the list goes on. None of Christina's albums sound the same yet you know when its a Christina Aguilera album. She speaks her mind but doesn't shove her opinion down your throat. People call her everything in the book yet she is still confident in herself. For me she is that voice for those of us who dont just luck into success or aren't conforming to what others want us to be. A lot of pop stars talk a big talk but they dont know the struggle like Christina. She has had some very high highs and some VERY low lows and she still manages to find the silver linings in it all. And that alone not only makes her an influential pop star but it makes her an influential PERSON. Completely agree with you. Well said. Ricco and anonymous, what you've both said is perfect :) Thanks so much for spelling it out! I agree totally..